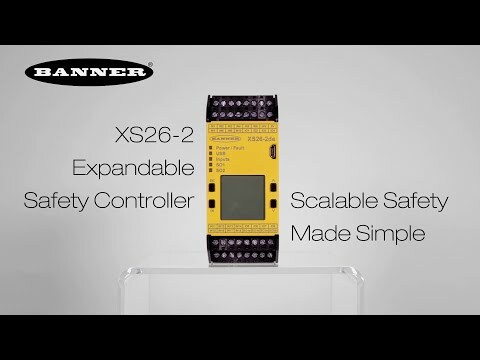 Minneapolis, MN—October 21, 2014—Banner Engineering announces the XS26-2 expandable safety controller. With the capability to add up to eight expansion I/O modules, the XS26-2 platform was designed to easily adapt to diverse automation requirements and address a wide range of safeguarding applications. The base controller models have 26 input terminals, four terminals for two redundant safety PNP outputs and a USB connection for loading configurations. Base models are available with an optional on-board display or an embedded Ethernet IP/Modbus TCP capability for access to live I/O status and system diagnostics to assist in troubleshooting and commissioning. The safety controller’s complementary PC Graphical User Interface configuration software is simple, uncluttered and easy to navigate for configuring and documenting safety functions and assessing the status of connected input or output devices. The system configuration tool uses a function block diagram format that consists of pre-engineered and pre-tested safety function blocks, as well as a set of Boolean functions. As the function block configuration is created, a corresponding logic ladder reference diagram and a text-based summary are created. To meet requirements of diverse applications, the XS26-2 platform offers six I/O expansion module models with a variety of safety inputs, solid-state safety outputs and safety relay outputs. For efficient terminal use, the XS26-2 base controller and expansion modules allow a portion of the safety inputs to be configured as outputs. During the configuration process, up to 64 virtual status registers are automatically populated with names of the input and output devices connected to the safety controller system. This enables remote access to the I/O device and system status information. Banner Engineering's XS26-2 expandable safety controller is a cost-effective, easy-to-use solution that is scalable to suit your specific system safeguarding requirements. With the option to add up to eight I/O expansion modules, the safety system is designed to meet your needs today, but is flexible to grow with your future machine enhancements. With eight optional I/O expansion modules, the safety controller can adapt to a variety of machines, including large scale with multiple processes.